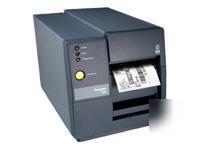 The EasyCoder 3400e is a versatile industrial strength printer based on the rugged, field-proven EasyCoder 3400. The attractive gray metallic color of the 3400e fits in industrial or office environments. The 3400e features up to 10 times faster printing throughput compared to the 3400, making it ideal for today's increasingly complex labels combining 2D bar codes, mixed fonts and graphics - no waiting for labels. The 3400e continues to offer the legendary reliability of the 3400 print mechanism. The steel frame enclosure gives the 3400e a rugged platform to withstand harsh industrial environments. The attractive gray metallic enclosure is designed to mask dirt and grime for ease of maintenance. The EasyCoder 3400e features dramatically improved label processing speed and printing throughput compared to the 3400 and the competition. The standard high-speed IEEE 1284 parallel port and enhanced serial port ensure fast host communications. The internal Ethernet adapter provides high throughput and network management without the complexity, space requirements and fragility of external print servers. A heavy-duty cutter with tray option is available on the 3400e printers. And of course, the 3400e is fully backward compatible with 3400A/B/C/D printers. It all adds up to a powerful printer that is designed and built to be the right solution for a large variety of industrial bar code applications. Please note that we do not accept personal or company international checks. There is a 10 business days grace period for all personal and company checks. It takes less time if you consider sending us a money order. Some money orders/cashiers checks can be held for 5-7 business days if the bank doesn't verify the information. Attention: APO deliveries can take up to 6 weeks. There is a 30 day grace period for all international checks. It takes less time if you consider sending us a money order. It takes 5-7 business days for international postal money orders to clear. All orders placed in OH are subject to %7.5 sales tax. All Returned Merchandise must be accompanied by an RMA number and received by our warehouse within 14 days from the date the RMA number was sent to you. Returned Merchandise without an RMA number will be refused. Software and licenses can not be returned, no exceptions.